This duo has had lots of experience performing in front of large audiences at top events. With their rendition of the Everley Brothers they play all their classics such as 'Wake Up Little Susie', 'All I Have to Do Is Dream' and 'Cathy's Clown'. 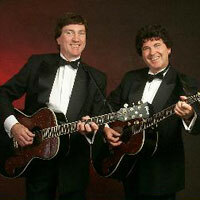 Their voices are stunning and it is difficult not to mistake them for the real Everly Brothers.